Decorative Wire Mesh also named stainless steel wire mesh, architecture wire mesh, cable wire mesh, and decorative mesh, It has been adopted more and more by the building field whatever on the material, structure or style because its beautiful metal color, concise style, good function, fashion and other more decorative elements. 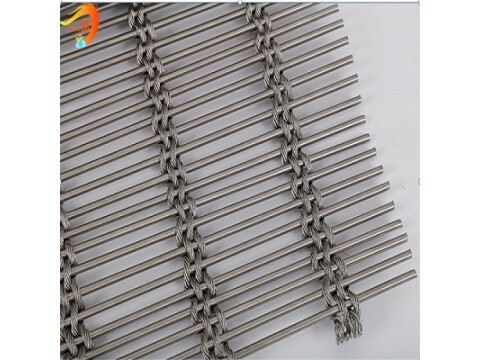 We can provide woven stainless steel wire mesh for architecture & decorations. Woven wire fabrics come in beautiful and unique designs, and these products are used mainly as decorative coverings for the whole buildings, walls, ceilings or floors.Description: Primarily designed to cater to the requirements of interior decorations and architects, a wide range of Stainless Steel Decorative Wire Mesh is used to add a dramatic and eye catching look in the interiors. Widely demanded for architectural decoration of hotels, residences, exhibition halls, museums and other commercial places, these are easy to fabricate and shape. We offer these wire mesh screens in different wire diameters, aperture and thickness to meet their individual requirements.